WHAT young Celtic Tiger cub wouldn’t give his eye fangs for an address like The Bottleworks? Its punning potential alone would justify the cost even without its salubrious D4 appendage. I know someone who bought one off plans. They’re nice apartments for sure, although they’re well underwater now. Eminently rentable since the Grand Canal tech area has oozed southwards a bit. Still would be a touch nervous walking around there late at night but nothing serious. Local kids occasional egg your car, that sort of thing. Homeowners or investors who are eager to sell up should do so before this summer - or they could struggle to sell their properties this year. This is what the Sunday Independent is hearing from property professionals and mortgage brokers on the ground. Some are warning that the momentum which built up in the property market last year has already gone and that this year could be a difficult time to sell a property. More than 7,500 people were approved for mortgages in the last three months of 2014 - about 46pc more than did so during the same months in 2013. Mortgage approvals are generally valid for about six months - hence some estate agents are reporting a scramble to use them up. Once those mortgage approvals lapse however, the property market could nose-dive - and even more so than it did last January. The most important thing however is supply and demand - and if buyers are drying up now that the Central Bank’s lending rules are starting to bite, this year could be a disastrous time to sell your home. That’s not a bad article from Charlie. Although I note he and the agents are blaming everything on the CBI rules, even though they were not even mooted when the Jan sales were agreed. But do agents not always say ‘sell now, sell with me’ when asked if it’s a good time? It’s always either a good time to buy or a good time to sell. Or in the current situation, both. I think some alluded to read eh the odd forum or something. 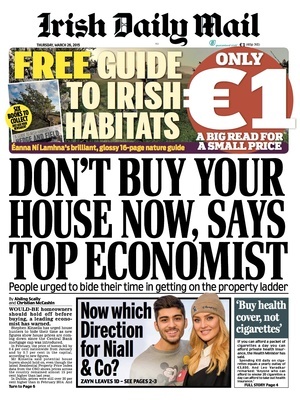 Interesting to hear a slight shift in the media today; the teaser for Pat Kenny show was about how you should forget about getting on the ladder and forget about the concept of a “starter home”. I think the someone is Louise McBride, the Indo article is actually signed by her. Finally a bit of logic being applied to analysis of new mortgage rules. This annoys me. It’s as bad that they tell you to buy now as to NOT buy now. Nobody can be completely sure of where the market is going to go, and when the market goes up again, what, the people who haven’t bought are going to go and blame the journalist who wrote this piece? Why can’t they just present the facts and let everyone decide for themselves? I know, I know, but it annoys me. The fact that the term “property ladder” remains in common usage shows we have learned nothing. cant understand how in the whole of County Dublin - all area - there are just 5 auctions (2 of which are land banks) scheduled. And don’t forget the fact that it makes sense for some people to buy now, even if it is known that prices will fall. “Now” is always a bad time to buy a TV, yet most reasonable people will buy one in their lifetime. Just means that auctions are not working. Sign of a wobbly market. But are you sure that’s all there are ?